Michelle Madow: Tips for BEA -- 10 things you'll want to keep in mind!! Tips for BEA -- 10 things you'll want to keep in mind!! Hi, everyone! It's mid-March, which means BEA is a little less than three months away. I'm definitely starting to get excited. I went to my first BEA in 2006 -- back when Stephenie Meyer was there signing ARCs of New Moon! So 2012 will be my seventh time at BEA! Through the years I've picked up some tips. Here are my TOP TEN tips you'll need to know for BEA! 2) Don't be pushy. Last year it sometimes felt like a stampede around the booths. I know you really want books, but I promise you will get a TON of them. Do not shove other people -- it's not nice! Sometimes it's hard to be patient, but please try to be. 4) Create a schedule ahead of time. There are so many awesome authors and great books at BEA that you'll want to be organized before going in! I recommend sitting down with the schedule and creating an Excel document, mapping out where you need to be and when to get the books you want. There's also a BEA App for iPhone users, but I don't recommend using it. I tried last year, but the cell service is so bad inside Javits Center that I found I was standing around waiting for my schedule to load when everyone else was just looking at their Excel sheets and heading to their next destination. 5) Dress nicely, but you can still be casual! I find that a nice pair of dark, fitted jeans and cute top works nicely. Don't dress messy (no holes in your jeans, stains or wrinkles on your t-shirt, etc.) However, my general rule is to wear something you feel comfortable in. You're going to be meeting a bunch of people through the day, so you'll want to feel confident in what you're wearing. 6) In the beginning of the day, go to the first floor, get a box, and write your name on it! Remember where your box is, because you'll be going down there a lot to drop off books. Be sure to drop off books at reasonable intervals, because you don't want to make your arm hurt halfway through the first day. Shipping is usually around $40, and for those of us who don't live in NYC, I recommend shipping your books home. You'll be thankful you did when you don't have to worry about finagling 150 lbs of books through New York City. 7) Stay fueled! You'll be on your feet all day, which can be exhausting. Be sure to have a good, protein-filled breakfast, and schedule out a time to sit down and have lunch. I know it's hard to give up precious time to eat, but you don't want to feel like you're going to pass out at the end of the day. 8) You will lose track of your friends/family/whoever you're attending with. Have your cell phone readily available so you can text and meet up if you lose people. Don't be afraid to go on your own if there's a book you want but your friends aren't interested in. Usually people will start chatting with you in line, and you'll meet new people. 8) Wander around the aisles of your favorite publishing houses on a regular basis. They'll set out piles of ARC's throughout the day that aren't mentioned on the schedule. Last year I got so many great books that way! 10) If you see an author walking around at lunch looking for a place to sit, invite them to eat with you and your friends. In 2010 my brother spotted R.L. Stine looking for a seat and invited him to join us. We ended up eating together for an hour and having a great conversation! It was so interesting talking with R.L. Stine about his books, and learning about his writing process. He's such a cool, nice guy! YAYYYYY! I'll have to figure out the details still but that is a good idea thank you very much! I'm so excited. :) Love getting tips from a Pro! :) Are you going there to sign any of your books or just there for the fun adventure? That's a wonderful story about R.L. Stine! I admit I know basically nothing about him beyond his books. I bet you learned lots of interesting factoids. I'm on the other side of the country so I doubt I'll ever make it to BEA but it's exciting that so many people get to go and experience so much bookish amazingness. I love reading the recaps and seeing what ARCs are around. I'm so excited and i can't wait to meet all these great people, hopefully I will catch you there too. Thanks for the really great tips as its my first time going! So excited!! Now I have to read Remembrance before BEA if there's a chance of running into you :). The schedule thing is a great idea, I have a map (highlighted and everything) but not really a schedule of where I want to be. Being that it's my first year though I'll probably just wander & hope I find things. :) Thanks for the tips! What wonderful advice you have given! I'm not going to BEA but I hope to go some day! I hope you have the best of times. 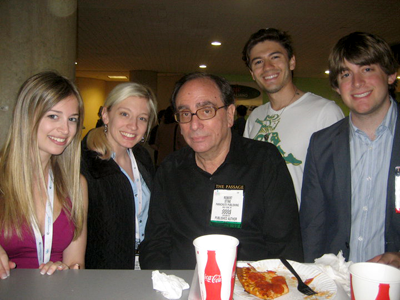 Kind of jealous about RL Stine. I'm a first time attendee to and love these tips. So cool about RL stine I would have never thought to do that.